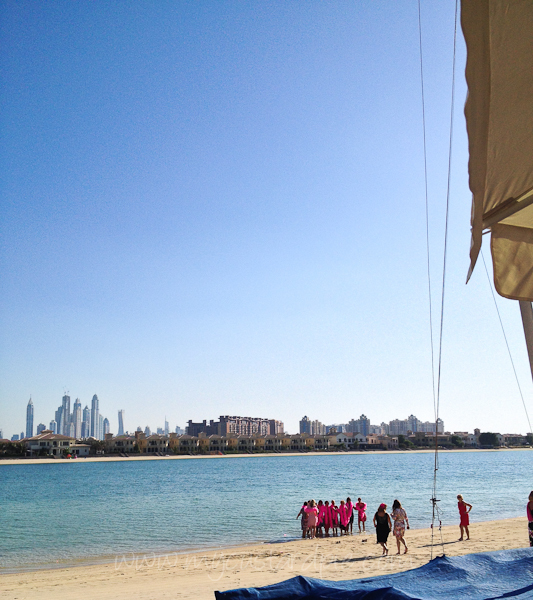 October goes into a frenzy of breast cancer awareness in Dubai. We’ve come a long way; within a couple of decades when even the word breast was taboo, now a pink ribbon is projected onto the Burj al Arab, there are radio and press ads, pink walkathons, running events and pink cupcakes sold in aid of ‘awareness’. It’s almost gone the other way (read here) and very strict rules about charitable giving mean that much of the money raised goes into spreading the word. I was invited to a ladies pink lunch and as the organisers were friends I said I’d go along (see more about the cause below). I met Catherine when we were both studying for WSET3, and she qualified to be a sommelier in the US too. She choose the wine for lunch (yes, you guessed it – predominantly pink). A friend and I taxied out to The Palm, a manmade island dredged out of the sand. Its narrow palm fronds mean that all villas have a ‘sea’ view and back directly onto a beach. Ladies arrive, negotiating the few steps down to the terrace on dainty high heels; there are swaying-brimmed hats and pink feather boas….masses of pink in fact, from shocking to the palest salmon. The food is also pink; pretty, dainty and provided by caterers Gustronomy (tiny cups carved out of beetroot filled with horseradish cream for instance). The first wine to be poured is Domaine Chandon Rosé. Think the name is familiar? This sparkling wine is made using méthode traditionnelle in the Yarra Valley, Australia – the same way used to put bubbles into Champagne. The winery was established by French Champagne house Moët & Chandon in 1986. I have a real soft spot for Massaya Rosé as my first glass was poured for me by Ramzi Ghosn of Massaya at a very relaxed gathering on the Ritz Carlton DIFC roof terrace here in Dubai. At the time, the rosé had just arrived in Dubai and now a couple of years later, a source tells me, it’s selling like wild fire and difficult to get hold of a bottle at present. Massaya is a Lebanese wine company in partnership with the owner of Chateau Trianon and co-proprietor at Le Vieux Télégraphe. No surprise then that the grape varieties used for this rose are those traditionally used for rosé in the Languedoc (Cinsault, Cabernet Sauvignon and Syrah) and it has a distinctly French-style. It was paired with a soup appetiser of chilled red pepper gazpacho (very rich and creamy) and a pink risotto topped with confit prawns. The appeal of this wine is the soft texture, raspberry and stone fruit, refreshing acidity and a dry finish, all balanced beautifully. If you see a bottle in Dubai, snap it up (at 72 AED incl. tax at MMI Dubai you can afford to). I’m betting the well-heeled crowd would have turned their collective noses up at this bottle if they saw it in the liquor store. However, as a crowd-pleaser the final wine was going down a storm. The waiters poured the Mondoro Asti with a flourish from its ornate green bottle (possibly designed for the Russian market where it sells very well). Made of Moscato grapes (beloved of hip-hop rappers) it’s sparkling tropical fruit cocktail in a glass, a little more than off-dry (that the maker’s claim) but not cloying. At 7.5% it’s perfect for day-time drinking and matched with the dessert of raspberry and honey terrine with strawberry semifreddo (72 AED incl. tax MMI Dubai). Proceeds from the lunch and prize draw went to Breast Cancer Arabia. They don’t just provide information, but practical support for care and treatment; vital in a country where private health care cover and costs is spiralling out of the reach of most. I hadn’t planned to blog about this so all pics taken on iphone. Thanks to the organisers for a really special event for a very good cause. Ever tried these wines? What do you think? ← The perfect word for wine tasting? Looks like such a pretty event! Lovely pink pictures taken by your Iphone… enjoyed reading the two related articles too! Doesn’t matter whether it’s pure marketing, but good to see that many commercial enterprises in Dubai taking up the pink cause during October. What a pretty pink day for a very good cause and so nice that the funds raised are used for more than just marketing. I’ve had Domaine Chandon Rosé at my hen weekend – love it! Great pics!